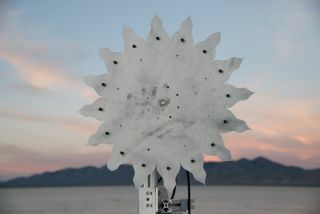 The desert is an ideal location for starshade testing, as it provides enough space to set up three stations — the light source, the starshade and a telescope. The light station is at the far end where a bright light source is located (the "star") along with very faint "planet" sources. The starshade station is in the middle, and the telescope station is in the foreground. After sunset, the team conducted tests using artificial starlight to study the results of 1/100th-scale Starshade designs. The desert location provides enough darkness for the light source to be the brightest thing around. When a person looks through the telescope, the starshade blocks the bright starlight to give the observer a clear view of the dimmer planet light. Steve Warwick, Northrop Grumman program manager for Starshade field testing, and Tiffany Glassman, astronomer and principal investigator for Starshade field testing, stand in the Starshade's shadow at the telescope station, demonstrating the technology's desired effect.